Saumyak is a typical 5 year old, always running around, always seeming like he's on a sugar high. He always has a question or two to ask, or something to say. One day, he started shaking his head frantically, and said repeatedly, “Bhuchaal aayo! Bhuchaal aayo!”, which means “It's an earthquake! It's an earthquake!” Saumyak lives with his family and other community members in a village in Nepal, which was destroyed by the earthquake on 25th April 2015. Saumyak showed us how the earthquake still haunts the people of Nepal. We've seen the devastation caused by the earthquake in Nepal. Flattening villages, bringing heritage sites to the ground, killing over 8000 people, and rendering hundreds of thousands homeless, the earthquake has left Nepal reeling from shock. Children don't have a school to go to; families don't have a house to live in. Makeshift tents host classes and serve as shelters for those displaced by the earthquake. Tarpaulins dot the mountainous landscape of the country. Each house, each building has to be built brick by brick again. And this is a daunting task that lies ahead for Nepal. 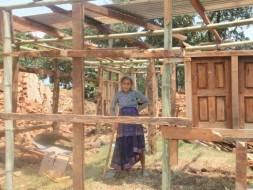 Manav Sadhna, an NGO based in Gujarat, has pledged to help rebuild houses in two clusters in Nepal – Ranipani and Bakultar. Manav Sadhna has been working for almost 25 years for the upliftment of the underprivileged, and currently has 4 centres in the country. The organisation works for community building, and providing healthcare, nutrition, and value-based education. We have always emphasised in the importance of living together in peace, without discrimination. Our centres serve the poorest of the poor, and help those who are shunned by society. Manav Sadhna has also worked on providing relief to natural disasters in India, including the Uttarakhand floods, the Indian Ocean tsunami, and the Gujarat earthquake. When news of the earthquake in Nepal broke, Manav Sadhna immediately felt compelled to reach out to our counterparts across the border. Our team of volunteers and staff reached Nepal and identified Ranipani and Bakultar as the communities we wanted to help. These clusters consist of around 300 homes. Activities included psychological support for the local families, helping them clear rubble and locate and secure possessions, comprehensively mapping the two clusters, conducting a thorough socio-economical demographic survey as well as an architectural survey. We also supported the medical services of the Dhulikhel Outreach Center with collegial support and additional medicines. As all of the families were engaged in building temporary housing, we decided to source and distribute galvanized steel sheets for roofing. We had also carried tarpaulin and blankets from India. We sourced the remaining requirements of tarpaulin and food packets from local organisations focused on relief work. Manav Sadhna is no stranger to helping build a community from scratch. When the Gujarat earthquake struck in 2001, we adopted a village called Ludiya and helped rebuild over 400 homes that had been destroyed by the earthquake. We would now like to repeat our feat in Nepal, where we plan on constructing 300 safe, earthquake proof homes in Ranipani and Bakultar (please click here for a detailed description of the structural design). 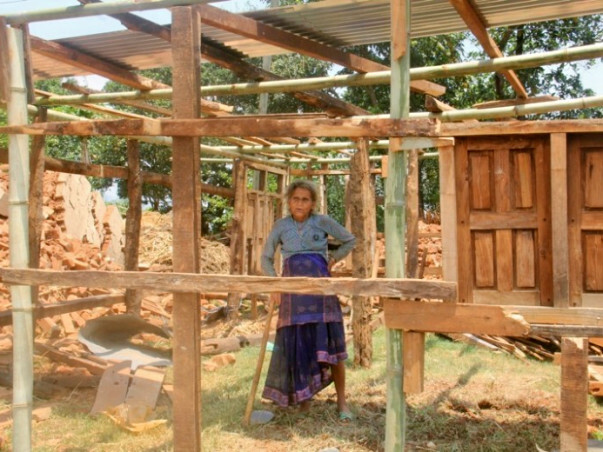 We plan on partnering with The cost for building 1 house is INR 2.5 Lakh ($4,000 USD). The cost for the total project is INR 7.5 Crore ($1.2 million USD). Please contribute towards helping Nepal get back on its feet. Manav Sadhna is a non profit organisation based in a quiet corner of Mahatma Gandhi’s Ashram, Ahmedabad. Our mission is to serve the underprivileged. At Manav Sadhna, we navigate with the philosophy of love all, serve all. By seeing God in every individual (Manav), mere service is transformed into worship (Sadhna). To this end, Manav Sadhna is engaged in constructive humanitarian projects that cut across barriers of class and religion while addressing issues faced by socio-economically neglected segments of society. In executing this mission, Manav Sadhna is guided by Mahatma Gandhi’s unshakable beliefs in love, peace, truth, non-violence and compassion. Manav Sadhna’s experience includes the reconstruction and rehabilitation of a village after the 2001 Kachchh earthquake, psychological relief and rehab of a fisherman village post the 2004 tsunami, and rehabilitation efforts around Netala village after the 2013 floods and cloud bursts in Uttarakhand.